Leuven --- Xenics, Europe's leading developer and manufacturer of advanced infrared sensors, cameras and customized imaging solutions from the SWIR to the LWIR realm, presents its high-speed infrared cameras for the SPIE Photonics West event. The Cheetah series remains to this date the fastest area-scan SWIR camera commercially available. With the introduction of the Manx line-scan SWIR series, the company now holds the title for being the provider of the fastest area and line-scan SWIR cameras in the world. Both cameras will be on display during Photonics West, with the Manx series seeing its first entry into the United States. Xenics exhibits in booths 8735 (BiOS) and 735 (Photonics West) at the Moscone Center. Entering the United States for the first time is the new Manx line-scan camera series. Launched during last year’s VISION trade fair, this short-wave infrared (SWIR) camera provides high quality line-scan imaging at unprecedented speeds of up to 390 kHz line rate. This outclasses similar cameras by a factor of 2.5, standing as the fastest in its category. The breakthrough speed of the Manx cameras is provided without losing other key performance factors, exhibiting a high QE in the 900 to 1700 nm wavelength range. On display for this year’s event will be the Manx SQ 2048 camera. This variant of the Manx encompasses everything vital to modern-day machine vision applications, providing high resolution square pixels with high speed and low noise. Alongside new products, the company’s full range of infrared imagers will also be presented. Many of these cameras hold unique attributes, such as the fastest area-scan SWIR camera, the Cheetah series, or the Xeva camera series with its extended response up to 2.5 μm. Xenics is well positioned to provide infrared imagers to system integrators, helping them realize solutions for one or more processes in production chains worldwide. 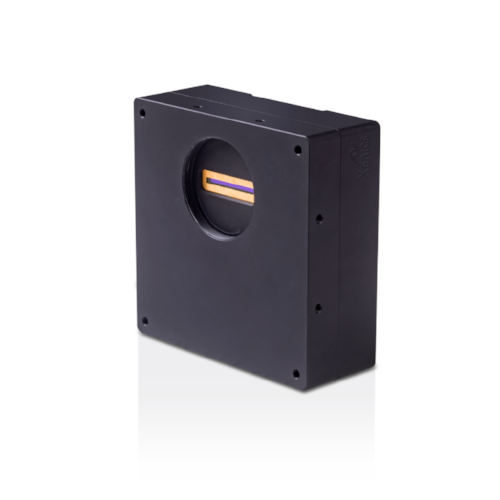 Being a vertically integrated manufacturer for SWIR imagers, Xenics is able to respond to customization requirements often required in such projects on multiple levels: from ready-to-use full cameras to camera modules and sensors. Visit the booth to discuss project requirements with the technical team and understand the full advantages of working with Xenics.